It is seldom easy to be content, let alone happy, after a defeat. Regardless of one's efforts, there is a distinct feeling that one was found wanting. On the other hand, Phil Jackson, the former NBA coach who led different teams to 11 titles, once said that there were defeats that clearly built a team - the ones where the players had given their all and surrendered their egos on behalf of something bigger than them. Tonight was one of those times for Portugal. Both coaches chose their favourite eleven, with one change on either side - the striker. While Paulo Bento's was a forced one, due to Hélder Postiga's injury, Vicente Del Bosque surprised everyone by choosing Negredo ahead of Torres and Fàbregas. The first few minutes let us see that the Spanish coach was going for someone a bit quicker when trying to lose his marker, in an attempt to force the Portuguese defence backwards. It was clear Spain meant business and were not willing to take Portugal lightly. Furthermore, Del Bosque maintained Xavi higher up than usual - just like he had done against France. With that move, Spain were trying to keep Veloso from having too much time on the ball and, from an attacking point of view, give Xabi Alonso the space to spray long balls and turn Xavi into a no. 10 of sorts. Xavi (yellow) played higher up for most of the match, both while attacking and defending. While Portugal did not pressure up high, they did try (and succeeded for the most part) to keep their opponents from calmly playing out from the back and make Xavi, Iniesta and Alonso play with their back towards Rui Patrício's goal. With Spain's usual lack of width - since Silva and Iniesta both drifted inward - and speed, there was not much danger of the back four being bypassed by balls over the top. Indeed, Bento's men often left Arbeloa to be marked directly by Coentrão, given that the Real Madrid full-back does not excel at bombing forward. It seemed as though Bento was setting the trap for the full-back to push forward, only to be caught in possession and vacate the space for Ronaldo. Portugal did not just sit and wait. On the contrary, they tried to trouble the Spanish build-up. Besides, Moutinho, Meireles and Nani were doing a great job on making sure they denied Spain their preferred passing options through the middle. By leaving Arbeloa to Coentrão, Meireles and Moutinho were able to focus their attention on their opponent's favourite route and provide an out-ball for Ronaldo's escapades. as much as possible against a side such as Spain. As expected, the Portuguese transitions often had Hugo Almeida as their main focal point, usually on Piqué's side, trying to drag the Barcelona centre-back out of position and open up space for Ronaldo, who had a clear goal of working the channel between Piqué and Arbeloa. Even though many of those long balls went astray, it clearly showed how Spain can be troubled by aerial duels - not because of the aerial duels themselves, but because it disrupts their well-drilled defensive positioning. Portugal were also very good at killing the Spanish transitions into attack. 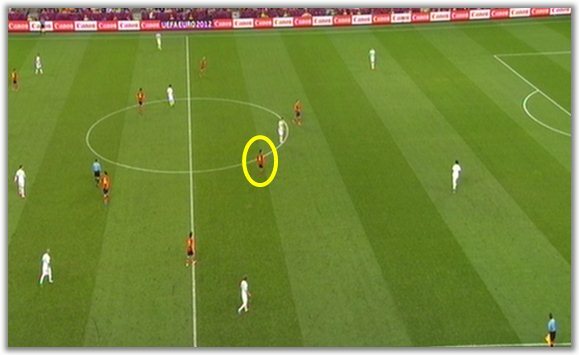 Moutinho was phenomenal in that particular regard, by always showing up to disturb the first pass and therefore preventing (usually) Xabi Alonso from picking the perfect pass to his team-mates. Even though there isn't actually any chalkboard that shows that, it is an invisible job that brought safety to Portugal's back four. With it, Portugal actually gave Spain a good run for their money and the possession stats at halftime clearly showed it: Portugal had 45% of time on the ball. Even though there were not that many clear-cut chances, Portugal and Spain each had a few opportunities to finish off the game. In fact, as the match went on, it became ever clearer that whichever team scored first would most likely win it. Navas came on for Silva 60 minutes in to try to stretch the play and there were actually a few plays that seemed to show that that was the way to go - now Coentrão could not play tucked in and had to meet the Spanish winger on the outside, which opened up space between the left-back and Bruno Alves. However, the World champions were not too eager to take advantage of that. In spite of all the intensity, this was not a game awash with scoring chances. 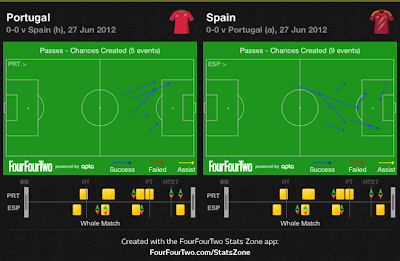 Despite taking the game to their opponents, Portugal clearly need to improve their finishing. Spain dominated all of the extra-time and could have even achieved victory, were it not for a huge save from Rui Patrício. 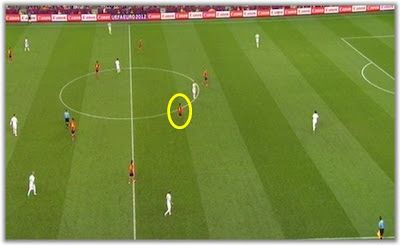 The Selecção looked too tired to keep running after the ball and Spain just kept racking up minutes on the ball. With Nani exhausted and Oliveira instead of Almeida, Portugal found it very hard to get the first pass after getting the ball back just right, which in turn resulted in more Spanish possession. All in all, this was a very interesting contest, tactically and otherwise. Even in defeat, Portugal can take solace in knowing they were worthy opponents to this superb Spanish team and that playing Spain (almost) in the eye is not something that we see every day. Despite the loss, the Selecção have showed that Del Bosque's team are not an insurmountable obstacle and that Portugal will soon become a force to be reckoned with in their own right. Chalkboards created via the Stats Zone app, available for free in the App Store. This article will also be available at PortuGOAL.net.